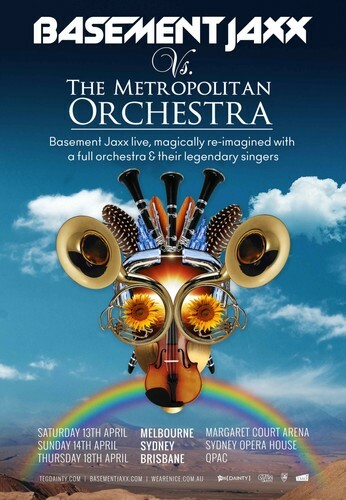 Basement Jaxx live on stage, magically re-imagined with a full orchestra & their legendary singers. TEG Dainty and Nice Events are excited to announce that esteemed electronic music duo Basement Jaxx will bring their orchestral live show to Australia in April 2019. The tour opens up in Melbourne on Saturday 13 April and moves on to Sydney on Sunday 14 April before winding up in Brisbane on Thursday 18 April. Tickets go on sale at 10am local time on Friday 14 December for the three-city tour. Felix Buxton & Simon Ratcliffe (better known as Basement Jaxx) are double Brit and Grammy Award-winning artists who have graced the biggest stages across the world, including: headlining the main stage at Glastonbury Festival, Hyde Park in London and The Hollywood Bowl. Following on from their ground-breaking 2011 album collaboration with The Metropole Orkest and the now seminal LIVE shows that accompanied it in London & the Netherlands, Basement Jaxx will unveil a new and updated version of the project as they creatively collide live on stage with Sydney’s The Metropolitan Orchestra at the iconic Sydney Opera House, as well as stops in Melbourne & Brisbane. Comprising magical re-interpretations of all the Basement Jaxx floor-fillers, as well as specially commissioned new work and a few surprises along the way, the show will also feature legendary Jaxx singers Vula & Sharlene Hector on powerhouse vocal duties. Basement Jaxx are no strangers to Aussie shores and have thrilled audiences over the years with their massive hit records including: 'Red Alert,' 'Rendez-Vu,' 'Jump N Shout,' 'Bingo Bango,' 'Romeo,' 'Where's Your Head At,' 'Do Your Thing,' 'Good Luck,' 'Oh My Gosh,' 'Hush Boy' & many more! They've collaborated with the likes of Robyn, Sam Sparro, Dizzee Rascal and have remixed for the likes of Pet Shop Boys, Daft Punk, Justin Timberlake, Adele, Mary J Blige and more. Landing in Australia in 2019, these shows promise to be a remarkable re-imagining of one of dance music’s most influential recording artists, in an extraordinary classical & contemporary re-boot of their original live show. Catch Basement Jaxx Vs. The Metropolitan Orchestra live on stage in Australia this coming April.